Save compared to buying parts separately! This complete kit provides all the components and cables necessary to power your flight controller and other onboard equipment. 27.5 x 19.5 x 10.5mm / 39g (without enclosure). 43.5 x 23.0 x 15mm / 44g (with enclosure). Output 2x 5.30V / 1x 12.0V / 3A -> /- 0.05V –> Ripple 1mV @ 1.5A output current. This cable connects a PL BEC to a Pixhawk 2.1. Inclusive LDO power supply ( 5.00V /- 0.03V) for the Sensor Board, Sensor Hub X2, or Sensor Hub X8. Flight controllers such as the Pixhawk have internally a 3-way power selector over an ideal diode chip. The 3 ways are: USB, the power port, and the servo rail. The flight controller can be powered by either one of those power sources. The flight controller is designed to select as the internal power supply whichever power source has a voltage higher by 0.25V to any other power source, as long as this voltage does not exceed 5.70V. 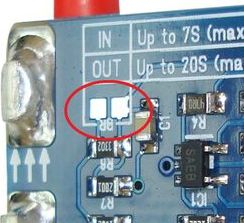 To prevent the internal ideal diode from switching too often between different power sources, a slightly higher input voltage (5.35V) is supplied by the PL BEC.